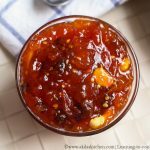 Tomato sweet Pachadi | Thakkali Sweet Pachadi is an authentic dish which is served in Tamil Brahmin weddings. 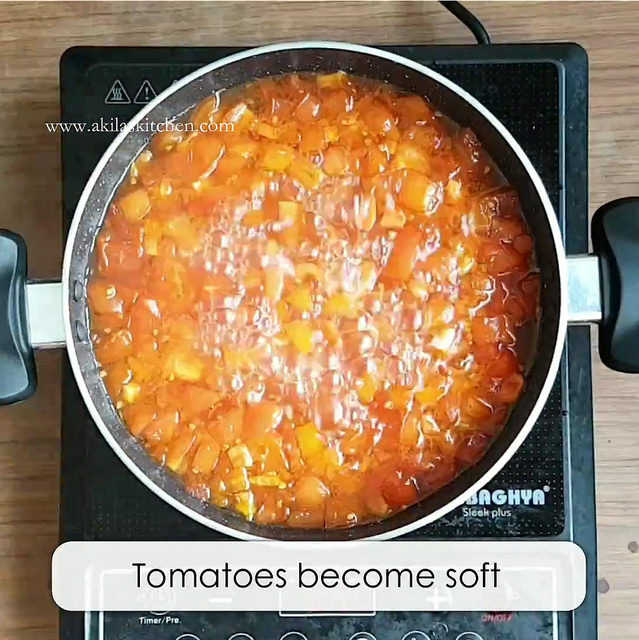 We will see the preparation of tomato sweet pachadi with video and easy step by step instructions for easy learning. 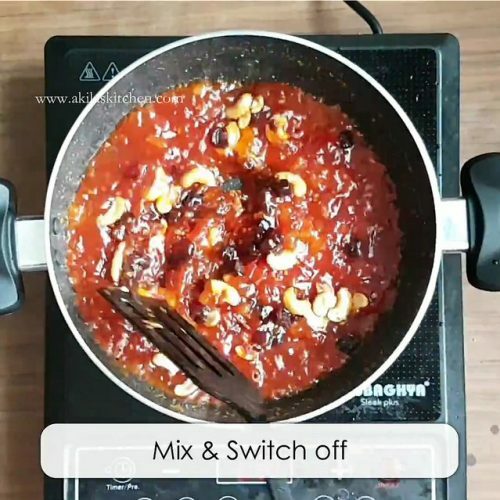 Today we will see the preparation of Tomato sweet Pachadi | Thakkali Sweet Pachadi recipe with video and step-by-step instructions. 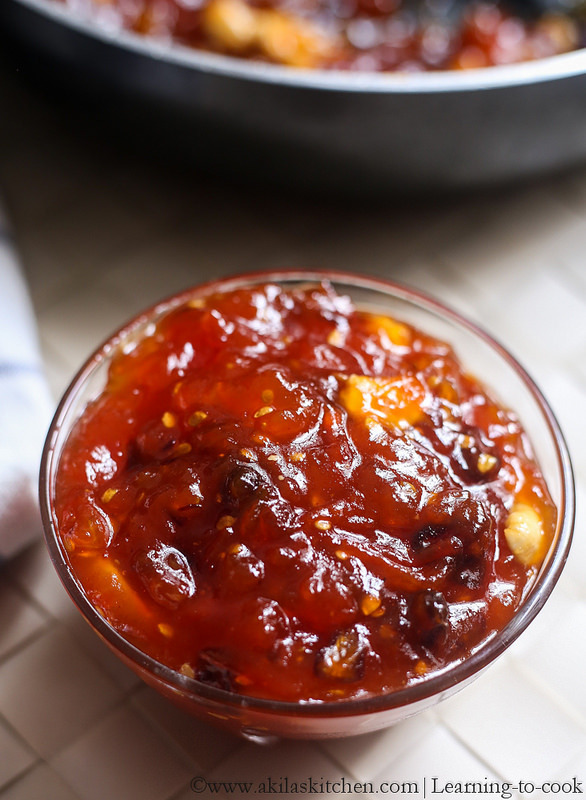 I have tasted this Tomato sweet Pachadi | Thakkali Sweet Pachadi in Tamil Brahmin weddings in my childhood. After coming to Singapore I missed going to the weddings and I missed this pachadi as well. While browsing the net I came across jeyashri’s site and tried the pachadi and it came out really well. It was so authentic and traditional that I got the taste of the tomato sweet pachadi which I used to eat in the weddings. I made this Pachadi in a traditional way that it takes more time like 45 to 50 minutes to get the correct consistency. But it is worth your time because the sweet and tangy taste of this Pachadi’s outcome is simply awesome. If you love this pachadi then you can also try my other recipes in this blog such as mango halwa using corn flour, traditional mango halwa, Rava Kesari, Semiya Kesari, Badam halwa, chana dal halwa, pooran poli. 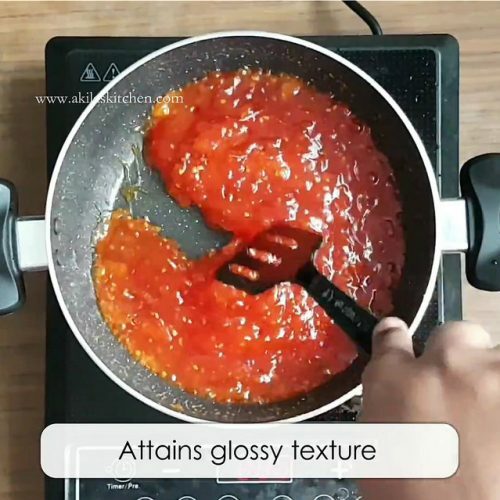 If you like recipes using tomato, then do check out these recipes – Onion tomato chutney, tomato bread toast, garlic tomato chicken roast, thakkali thokku, cucumber tomato salad, Tomato pulao. 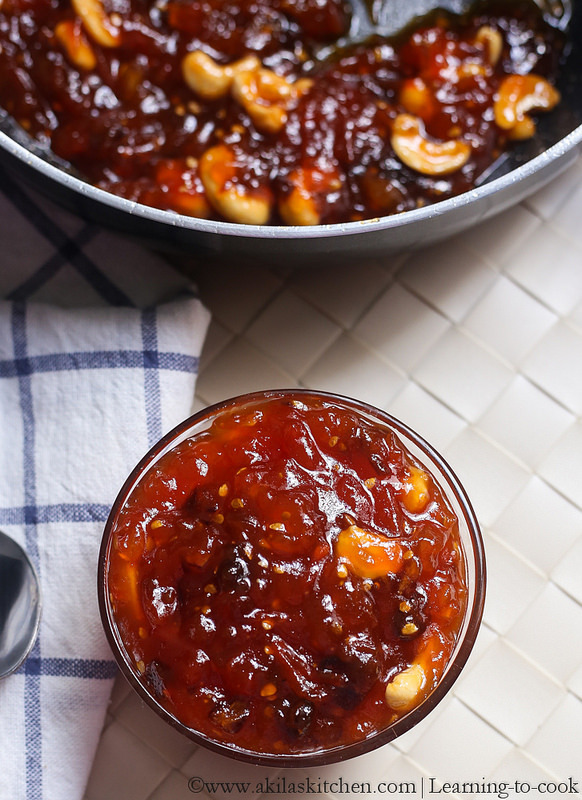 Tomato sweet Pachadi | Thakkali Sweet Pachadi is an authentic dish which is served in Tamil Brahmin weddings. in a traditional way that it takes more time like 45 to 50 minutes to get the correct consistency. But it is worth your time because the sweet and tangy taste of this Pachadi's outcome is simply awesome. In the heavy bottom pan one tablespoon of ghee and cashews raisins and dates. 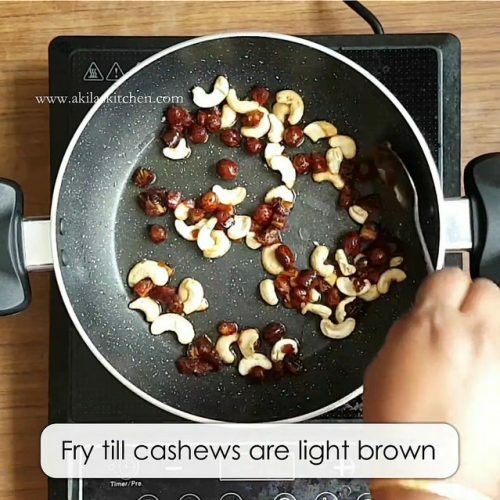 Fry them nicely till the cashews have become light golden color. Remove and keep them aside. In the same pan add sugar and water. No need to wait for the sugar to dissolve completely. Just add the water and slightly mix and leave it. Also do not add more water than mentioned because the tomatoes will leave out water while cooking. 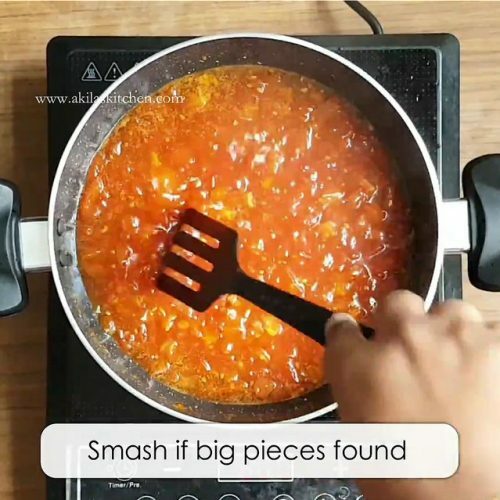 Now add the tomatoes and Cook the tomatoes nicely and smash them if you find any big pieces. To get the perfect consistency the tomatoes need to be cooked for nearly 40 to 50 minutes of time. Also always cook them in low to medium flame after 30 minutes of time. 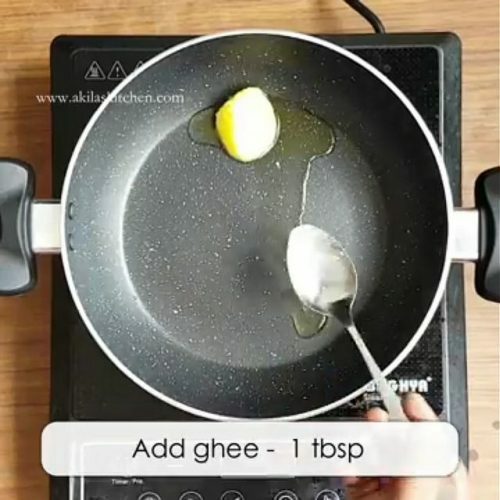 After 30 minutes of time and one tablespoon of ghee and again after 45 minutes of time and one tablespoon of ghee so that it gives a rich taste. Once all the water content evaporates and the tomatoes will get the glossy texture and the consistency becomes thick. 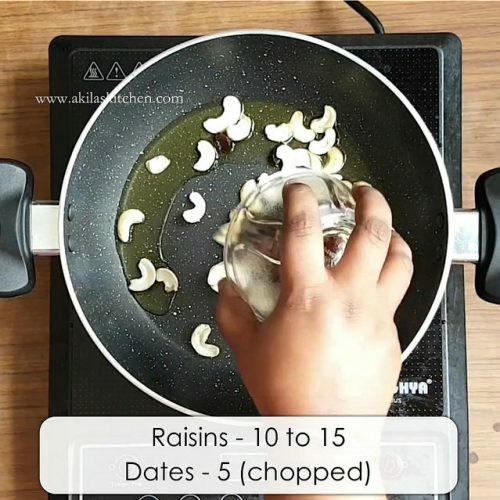 Now you can add the fried cashews, raisins and the dates and mix them for 2 minutes. 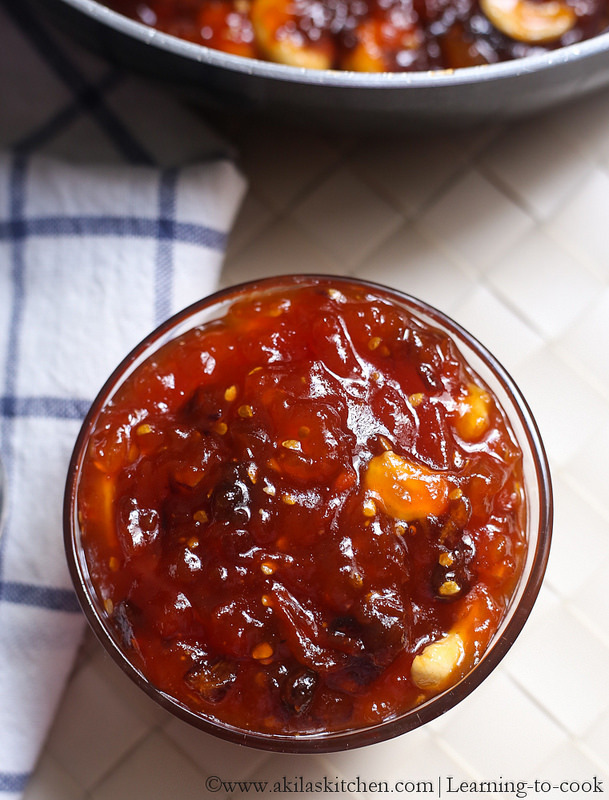 Serve the tomato sweet Pachadi either hot or cold. It will taste awesome in both the ways. Yummy & Tangy tomato sweet pachadi is ready to be served. 1. 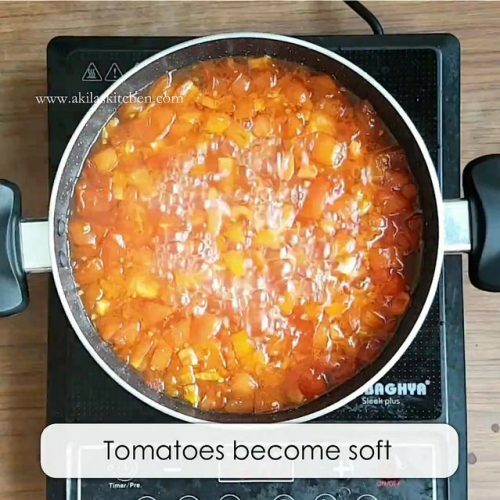 Do not add more water than mentioned as the tomatoes leave water. 2. Adding salt is purely optional. 3. Also you can add little cardamom or vanilla essence if you want some flavor. 4. This.can.be stored more than 3 weeks in refrigerator. 5. Dates should be deserts and chopped finely. 6. If you want, you can add a pinch of salt. It enhances the taste. 7. If you want to make healthier version, then replace sugar with jaggery or palm sugar and try. 1. In the heavy bottom pan one tablespoon of ghee and cashews raisins and dates. 2. Fry them nicely till the cashews have become light golden color. Remove and keep them aside. 3. 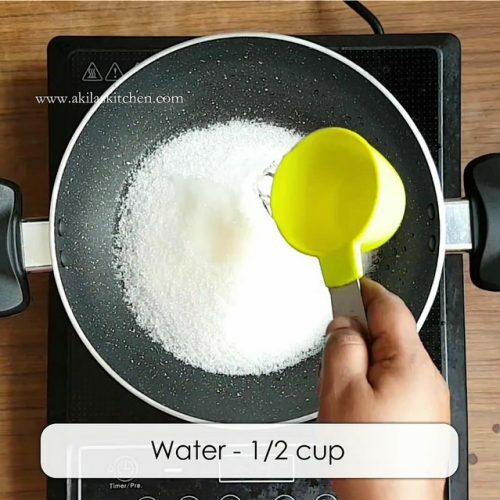 In the same pan add sugar and water. 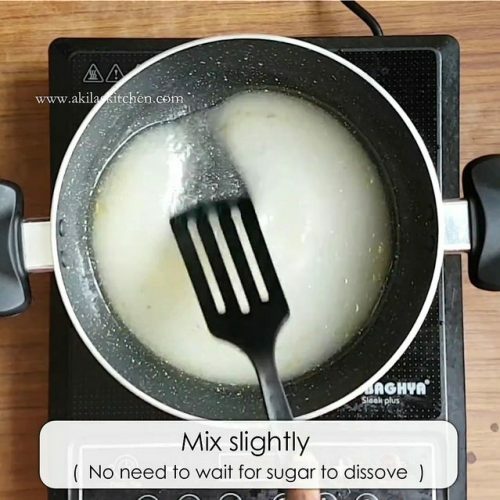 No need to wait for the sugar to dissolve completely. Just add the water and slightly mix and leave it. 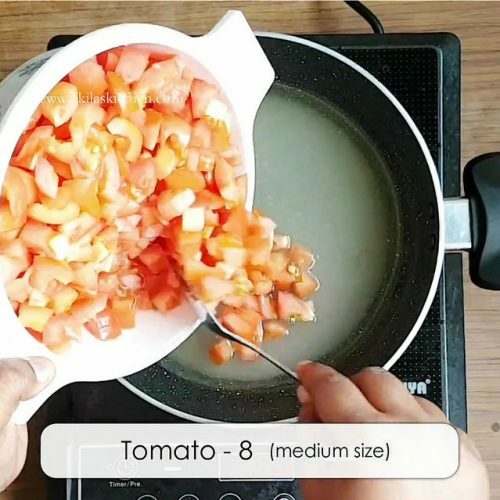 Also do not add more water than mentioned because the tomatoes will leave out water while cooking. 4. Now add the tomatoes and Cook the tomatoes nicely and smash them if you find any big pieces. 5. To get the perfect consistency the tomatoes need to be cooked for nearly 40 to 50 minutes of time. Also always cook them in low to medium flame after 30 minutes of time. 6. 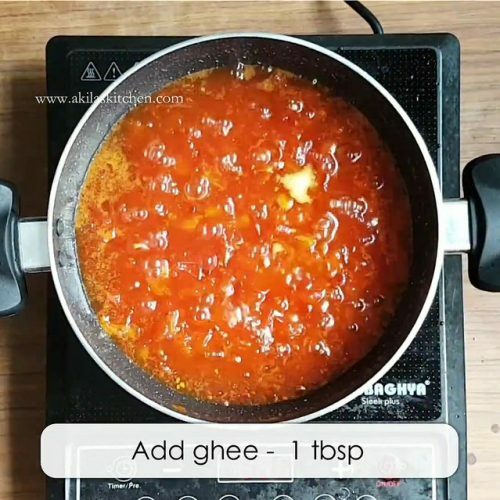 After 30 minutes of time and one tablespoon of ghee and again after 45 minutes of time and one tablespoon of ghee so that it gives a rich taste. 7. Once all the water content evaporates and the tomatoes will get the glossy texture and the consistency becomes thick. 8. Now you can add the fried cashews, raisins and the dates and mix them for 2 minutes. 9. 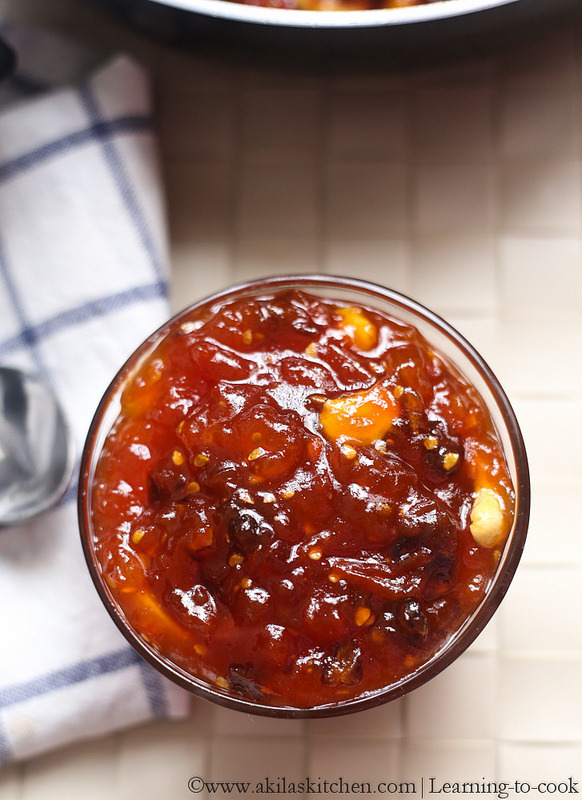 Serve the tomato sweet Pachadi either hot or cold. It will taste awesome in both the ways. 10. 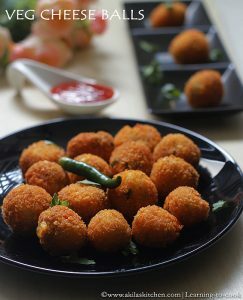 Yummy & Tangy tomato sweet pachadi is ready to be served.